There are so many reasons to smile — a funny joke, a cute kitten, a new baby, and many, many others. But at our Austin dental office, we want to give you a few more reasons to smile big and wide. If the way your teeth look is holding you back from experiencing all the health benefits smiling provides, call our dental office in Austin. We will talk about your smile goals and the best ways to achieve them. Welcoming new patients from Austin, Westlake, Cedar Park and beyond. While it’s typically recommended that everyone has a preventive dental care appointment and dental cleaning at least twice a year, men are less likely to visit their Austin dentist regularly than women. Many men skip these important check ups and rather only schedule an appointment once they have a problem. The truth is, seeing the dentist every six months can keep these problems from occurring in the first place and help keep mouths and bodies healthy. Advanced Dental Treatments. 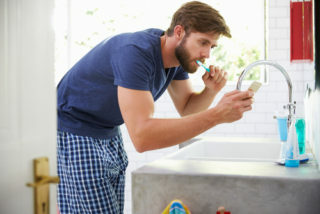 Since we now know that many men don’t maintain regular dental care to help keep small concerns from getting more serious, it should come as no surprise that the likelihood for needed advanced dental treatment in men is higher. 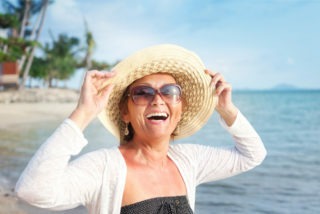 One of the common dental problems across all ages and genders is decay. When decay is left untreated, there’s a higher risk for a necessary root canal and dental crown. When it’s really bad, teeth may fall out or need to be extracted then replaced with a dental bridge, dentures, or dental implants. Gum Disease. The American Dental Association (ADA) and Academy of General Dentistry (AGD) report that men are more likely to suffer from gum disease than women. In fact, between the ages of 30-54, 34% of men have gum disease compared to 23% of women. Gum disease is a serious condition that not only affects the mouth, but can contribute to other problems throughout the rest of the body. There’s evidence to support that gum disease may lead to heart disease, respiratory disease, and even certain types of cancer. Regular visits to the dentist help diagnose gum disease early before it has a chance to affect whole-body health. Oral Cancer. The word cancer itself always insinuates fear. Oral cancer is no different and actually kills more than 8,000 people a year. When caught early, treatment can be very successful. When it’s not, there’s a whole host of issues that can result. If facial surgery is needed to remove the cancer, there’s a chance for disfigurement. Oral cancer can also spread to other areas of your body, making treatment more complex. Your dentist will check for oral cancer at every preventive care appointment and get treatment started as soon as possible if there’s a problem. If it’s time for you to take care of your smile and see a dentist, call our dental office in Austin to schedule an appointment today. Accepting patients from Austin, Westlake, Cedar Park and beyond.